For Immediate Release: Posted On 1/14/2013 By Industrial Magnetics, Inc. 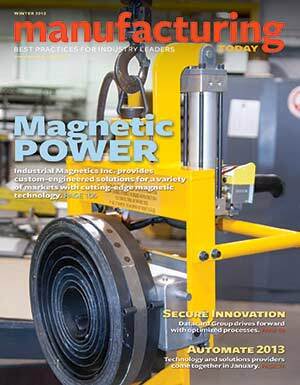 The article discusses how Industrial Magnetics specializes in custom-engineered solutions for a variety of markets utilizing cutting-edge magnetic technology and how recent advances have made their magnetic products stronger, safer, lighter and one of the most reliable tools for manufacturing processess involving steel work holding, lifting, fixturing, conveying and magnetic separation. Also highlighted are IMI’s "Custom Solution Profiles" designed to educate & inform customers of unique magnetic applications, and IMI’s new Remote- Controlled DynamicLift Magnet, which allows the operator to use a hand-held remote to turn a permanent magnet on & off.